Gorgeous supernatural mystery, The Vanishing of Ethan Carter, is due out next month. Developer The Astronauts announced a release date of September 25th today and you can grab it on Steam or through GOG. If you want to get a head start on solving the case, there’s now a 13 minute developer walkthrough of the start of the game. It’s absent major spoilers, and is simply very pleasant to watch (despite the blood), as Red Creek Valley is a treat for the eyes. Surprisingly, the adventure game that immediately springs to mind when watching the walkthrough is Murdered: Soul Suspect. The floating text clues, the jigsaw style approach to putting together crime scenes, giving a voice to the dead (Though Ethan Carter does this in a much subtler way) – there are quite a few similarities. And despite Soul Suspect ultimately not being very good, it was still quite fascinating. It strikes me that supernatural adventure games number among the very best. Gabriel Knight, Phantasmagoria, Monkey Island, Blackwell – all great. 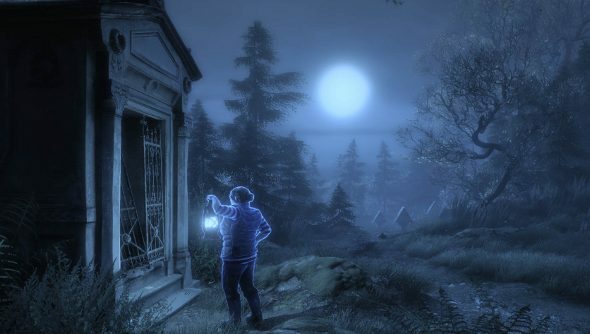 Come September, we’ll find out if The Vanishing of Ethan Carter continues the tradition.